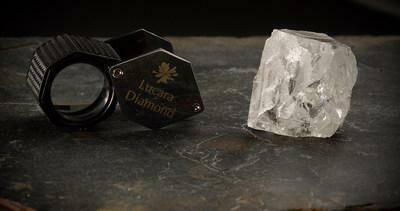 VANCOUVER , April 26, 2018 /CNW/ - (LUC – TSX, LUC – BSE, LUC – Nasdaq Stockholm) Lucara Diamond Corp. ("Lucara" or the "Company") is very pleased to announce the recovery of a 327 carat, top white gem diamond (picture attached), from its 100% owned Karowe Diamond Mine located in Botswana. Eight diamonds greater than 100 carats have now been recovered at Karowe since the beginning of the year, including the 472 carat diamond announced earlier this month (see press release of April 12, 2018 ). Lucara also wishes to announce its intention to hold an Exceptional Stone Tender (EST) in June 2018 that will include for sale the 327 and the 472 carat diamonds, alongside other qualifying diamonds that have been recovered since the start of the year. Viewings will be held in Gaborone, Botswana between June 10 and June 19 with the tender scheduled to close at 4 pm CET on June 19 , 2018. The information in this release is subject to the disclosure requirements of the Company under the EU Market Abuse Regulation. This information was publicly communicated on April 26 at 5:00 a.m. Pacific Time . Forward-looking statements are based on the opinions and estimates of management as of the date such statements are made, and they are subject to a number of known and unknown risks, uncertainties and other factors which may cause the actual results, performance or achievements of the Company to be materially different from any future results, performance or achievement expressed or implied by such forward-looking statements. The Company believes that expectations reflected in this forward-looking information are reasonable but no assurance can be given that these expectations will prove to be accurate and such forward-looking information included herein should not be unduly relied upon. In particular, this release may contain forward looking information pertaining to the following: the estimates of the Company's mineral reserve and resources; estimates of the Company's production and sales volumes for the Karowe Mine; processing capabilities, recovery rates, cash flows and sales volumes for the Karowe Mine, including the potential effect of the development and integration of the proposed underground mine at Karowe on production, sales volumes and the expected LOM; estimated costs to construct the proposed Karowe underground development and the timelines associated therewith; expected exploration and development expenditures and expected reclamation costs at the Karowe Mine including associated plans, objectives and economic estimates; expectation of diamond prices and changes to foreign currency exchange rate; expectations regarding the need to raise capital; possible impacts of disputes or litigation and other forward looking information.